Progressive pricing that fits your budget. Clean up your copy and avoid embarrassing, costly mistakes. We specialize in proofreading high volumes of financial communications, including employee benefits materials. All backed by our 110% accuracy guarantee. Perfect for large firms and agencies that generate a high volume of content every month. Includes service level agreement, monthly feedback to improve workflows and quality, and errors & omissions coverage. All backed by our 110% accuracy guarantee. Learn more. Perfect for smaller firms and agencies that consistently generate 500 pages of content every month. Includes service level agreement, monthly feedback to improve workflows and quality, and errors & omissions coverage. All backed by our 110% accuracy guarantee. Learn more. 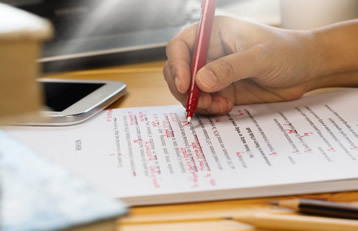 Geared toward firms, agencies, and individuals that occasionally need proofreading services. Includes service level agreement and errors & omissions coverage. All backed by our 110% accuracy guarantee. Learn more. Optimize workflows, reduce fixed costs, and get timely, accurate, reliable proofreading services. Get answers to frequently asked questions.